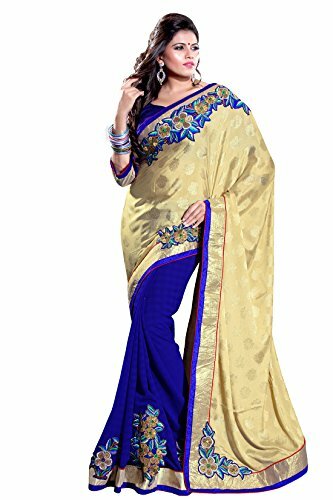 This beige and blue jacquard and chiffon patch work party wear saree will surely make you look eye-catching. This saree comes with an attached art silk blouse fabric which can be customised from 32" to 42". Blouses with elaborate patterns and colors are used for photo-shoot. Color and pattern of the blouse might not be as shown in the image. (slight variation in color, design and patch border work is possible). Mirchi fashion (division of sourbh sarees) brings together the best of ethnic fashion from the indian subcontinent to indian wear lovers across the world, with a variety of popular and trendy ethnic products for various occasions - wedding sarees, party wear sarees, to contemporary indian suits and salwar kameez. The collection of indian ethnic clothing like indian sarees, bridal sarees, bandhani sarees, party wear sarees, saree, wedding sarees, georgette sarees, surat sarees, embroidered sarees, lehenga sarees, salwar kameez and party wear salwar kameez gets revamped by latest additions to the catalogue. So the next time you feel like catching hold of the most fashionable and premium quality sarees or salwar suits, you are welcome to shop from the saree collection of mirchi fashion as we bring you the exclusive & premium collection of latest sarees, indian sarees, bridal sarees, georgette sarees, saree blouses, sarees, wedding sarees, embroidered sarees, lehenga sarees, lehenga style sarees, printed sarees, silk sarees, latest salwar kameez & salwar suit designs like anarkali dresses, salwar kameez, indian salwar kameez, wedding salwar kameez, bridal salwar kameez & much more. Note: This saree comes with an unstitched Blouse piece/fabric of 0.8 meters in length, attached with the saree itself. Also slight variation in color, design and patch border work is possible. If you have any questions about this product by Sourbh, contact us by completing and submitting the form below. If you are looking for a specif part number, please include it with your message.